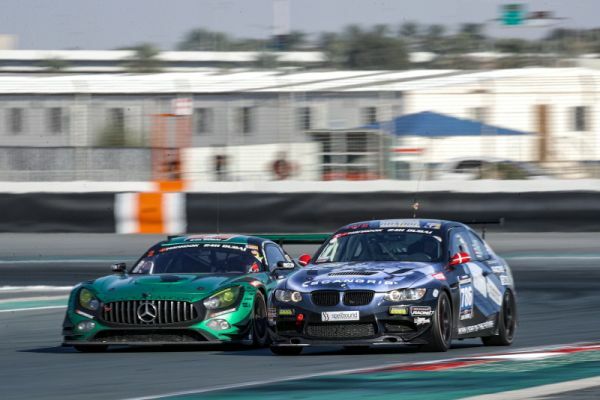 12.01.2018: Under a blue sky, in bright sunshine and with the highest temperatures of the week in Dubai, the 13th running of the Hankook 24H DUBAI got underway at Dubai Autodrome. 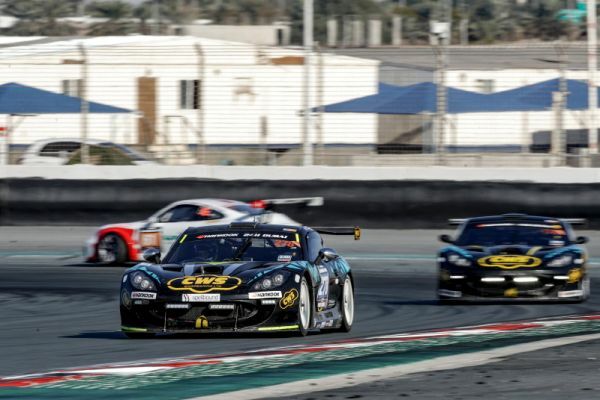 Under a blue sky, in bright sunshine and with the highest temperatures of the week in Dubai, the 13th running of the Hankook 24H DUBAI got underway at Dubai Autodrome. A total of 89 cars took the start for the marathon race twice around the clock at the 5.390 kilometres long circuit. 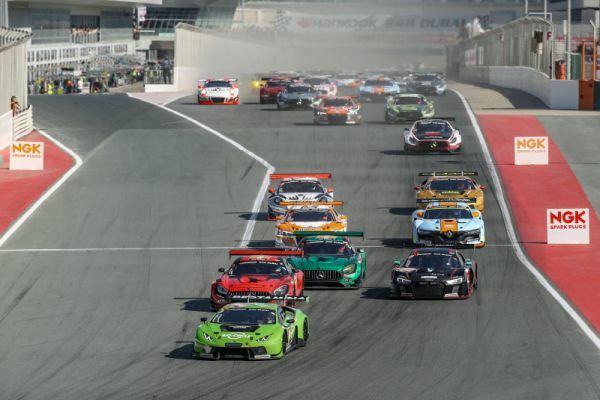 The first four hours of racing have produced good competition with eight lead changes in the GT class. After four hours, last year’s Dubai race winners Herberth Motorsport are leading outright with the Porsche 911 GT3 R (#991, Allemann/Bohn/Renauer/Renauer/Olson). The current TCE SERIES leader is the CWS Ginetta G55 (#278, Hayes/Wells/May/May). Two cars didn’t make it to the start of the race following accidents earlier in the week: the Optimum Motorsport Audi R8 LMS (#96, Haase/Ellis/Wilkinson) was sidelined after a crash in yesterday’s night practice and the Bonk Motorsport Audi RS 3 LMS (#127, Bonk/Piepmeyer/Burghardt/Wirth) was a non-starter due to an accident in the optional private test on Wednesday. 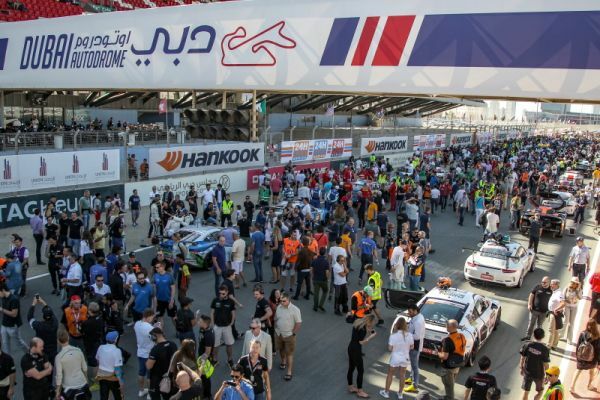 Thus, 89 cars took the start of the 13th running of the Hankook 24H DUBAI as His Highness Sheikh Juma al Maktoum and His Excellency Dr. Mohammed Ben Sulayem, president of the ATCUAE and vice-president of the FIA, waved the national flag of the United Arab Emirates to send off the field. Mirko Bortolotti was the early race leader in the pole-winning GRT Grasser Racing Team Lamborghini (#964, Ineichen/Ineichen/Engelhart/Bortolotti), but his joy lasted only nine laps as he then had to come into the pits due to a punctured left rear tyre. After that, the Black Falcon Mercedes-AMG GT3 (#3, Al Qubaisi/Bleekemolen/Stolz/Metzger) led for 21 laps until the first sequence of pit stops that saw several other teams alternate in the lead, only to stay there for one lap. The next team to lead a little bit longer was the Hofor Racing Mercedes-AMG GT3 (#1, Kroll/Kroll/Eggimann/Heyer/Frankenhout), but on lap 50, at the end on the second hour, the Herberth Motorsport Porsche came to the fore and has stayed there until the end of the fourth hour. So far, there have been two code 60s, one to allow for a stopped car to be removed and one to clean up fluid that had leaked from one of the cars. In the TCE SERIES powered by Hankook, it is a tight battle between the two CWS Ginettas (#178, White/Constable/Murray/Liebenberg and #278, Hayes/Wells/May/May) as well as the Optimum Motorsport Ginetta (#232, Barwick/Moore/Hollings/Brough) as the SP3 class pace-setters and the front-runners in the TCR class, in which the Modena Motorsports SEAT (#216, Shen/Shen/Tjia/Simonsen/Beche) has spent the best part of the first four hours in the lead.